case with lightweight plastic end-caps. Additional features include safe power-arming along with advanced programmable features such as low voltage cutoff, braking, timing, throttle input range and more, making this truly a ‘pro series’ speed control. When performance matters in your high-current applications, look no further than the E-flite® 60-amp Pro switch-mode ESC. This is a high-quality, efficient sensorless brushless electronic speed control with an integrated switch-mode BEC. It can operate without the need for a separate receiver battery to power your servos and receivers, saving you weight and complication. 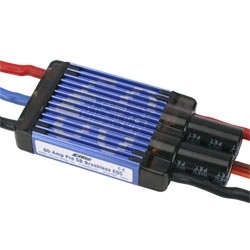 It is capable of up to 60 amps continuous current when using 3- to 6-series Li-Po battery packs. You can drive up to 7 analog or 6 digital standard-size servos with the BEC on any recommended input voltage. Featuring an exposed, finned heat sink aluminum case with lightweight plastic end-caps, safe power-arming along with advanced programmable features such as low voltage cutoff, braking, timing, throttle input range and more, the E-flite 60-amp Pro switch-mode ESC is truly a ‘pro series’ electronic speed control. Drives up to 7 analog or 6 digital standard-size servos with the BEC on any recommended input voltage. This also includes up to 7 standard analog or 5 standard digital and 1 retract servo, perfect for Hangar 9® 60-size warbird conversions. Some other brands and models of servos may have significantly higher current draw. Digital servos and binding servos of any kind typically have higher current draw. As a general rule, mini and micro servos draw less current which may affect your servo usage as shown in the examples above. We recommend the use of a Hangar 9 servo and receiver current meter (HAN172), installed between the throttle lead of the ESC and receiver, to confirm current draw of the actual servos used. Also, always be sure to position the ESC for maximum airflow since cooling can significantly aid in the performance of the BEC.